You’re ready to get started. Press the Start button on your Xbox 360 — now! The first choice you need to make is the language you want the Dashboard to use. This page lets you choose what language you see when navigating the Dashboard. 1. Select the language you prefer to use in the Dashboard. 2. Press the A button on your controller to set the language. Xbox Live requires a high-speed Internet connection. An offline profile is an Xbox 360 identity you don’t use with Xbox Live. Your offline profile’s scores and other data (such as your preferred controller settings) are stored on a memory unit or hard drive and are available only on the Xbox 360 that you are playing on. 1. Press A to use the default option, Create an Offline Profile. 2. Select a storage device and press A. After you press A, a keyboard screen appears (Figure 1) and prompts you to enter your gamer profile name. Figure 1: Create a new gamer profile. 3. Create your gamer profile name and press the Start button. After you press the Done button (or just press the Start button on the controller — the result is the same), the Gamer Picture screen opens. If you want to use Xbox Live,the following sections show you how. 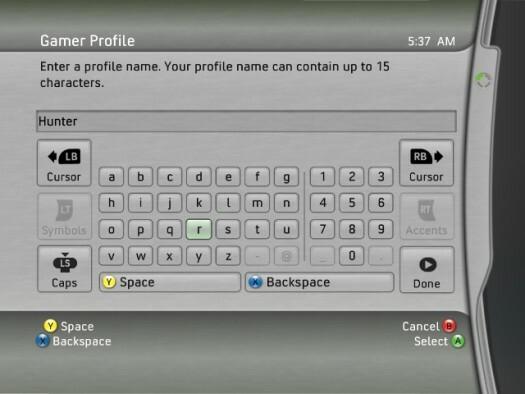 If your Xbox 360 console is connected to a high-speed Internet service, you can create a profile that uses Xbox Live. Before you connect to Xbox Live, make sure that your Xbox 360 console is connected to your home network or high-speed Internet modem to ensure a smooth connection. The Xbox Live setup steps depend on whether you’re already an Xbox Live member. If you’re an Xbox Live member already, you can add your Xbox Live account to your gamer profile after you select the Xbox 360 console’s language. 1. On the Gamer Profile screen, use the left analog stick (or the direction pad) to scroll down to I Am a Member of Xbox Live and then press A. 2. Press A to open the Keyboard screen, and then enter your current gamertag. 3. If you want to use a Microsoft .NET Passport account with Xbox Live, follow the on-screen instructions. If this is your first Xbox, or if you have never had an Xbox Live account, you can create a new Xbox Live account after you select your console’s language. 1. On the Gamer Profile screen, select I Want to Join Xbox Live and then press A. 2. Scroll to the Join Xbox Live option and press A. 3. Select Yes and press A to continue. 4. Enter your gamertag and press Start. • If the name isn’t available, you’re prompted to try another name. • If the gamertag is accepted, you are automatically prompted to link to your Passport account. • Yes, I do(you have a Passport account). • After you sign in to an existing Passport account, you can skip to Step 16. • No, Create One(you don’t have a Passport account). 6. If you select No, Create One, you can now choose your Locale. 7. Set your preferred language. 8. Set your birth date. 9. Enter your e-mail address. 10. Select a password, a secret question, and a secret answer. 11. Select Next and then press A. 12. Enter your first name, last name, phone number, and contact e-mail address. 14. To accept the terms, choose Accept and press A. 15. Pick your Xbox Live membership type. • The Gold (paid) account lets you in on multiplayer games on Xbox Live. • The Silver (free) account lets you download game updates and purchase new content through Xbox Live. 16. Confirm your account type choice (and enter payment details if you chose Xbox Gold). 17. Choose a gamer picture. 19. Decide whether you want to subscribe to e-mail information about Xbox Live.